David Stockmal was a chef at a restaurant when the owner died and he suddenly found himself out of work. Stockmal had no way of knowing then that his unfortunate situation was actually just the start of an exciting new career path. His brother, Gerald, a graduate of the Rutgers Two-Year Professional Golf Turf Management School, was Assistant Superintendent at Whitemarsh Valley Country Club and hired David to do seasonal labor. David excelled at the work and a mere three months later, Paxon Hollow Country Club Golf Course hired him as a full-time grounds crew member with benefits. "I was very excited," said Stockmal. Six months after that, David was offered an exciting chance to expand his skills and education. "Steve Stephens [Paxon Hollow's Superintendent and David's boss] asked if I wanted to go to Rutgers." Stockmal jumped at the opportunity that seemed to come at just the right time in his life. "I was recently married and it was the best fit for my schedule." Although he was intimidated at first because he never went to college, David quickly settled into the schedule of classes and got the knack of studying and test-taking. His hard work paid off when he graduated eighth out of his class of forty-four students. "I was very impressed with the knowledge and level of detail presented in the class and with the teachers, staff and facilities," said Stockmal. Upon graduating, David Stockmal returned to Paxon Hollow and nice promotion: he became one of two Assistant Superintendents at the course. Paxon Hollow Country Club Golf Course is located in Media, Pennsylvania. 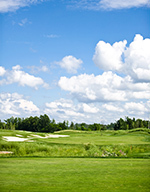 For information, call 610-353-0220, or visit www.paxonhollowgolf.com. Former chef David Stockmal left the food industry for a golf turf career and found an Assistant Superintendent position after studying at Rutgers.